Real-time and embedded systems face the same development challenges as traditional software: shrinking budgets and shorter timeframes. However, these systems can be even more difficult to successfully develop due to additional requirements for timeliness, safety, reliability, minimal resource use, and, in some cases, the need to support rigorous industry standards. 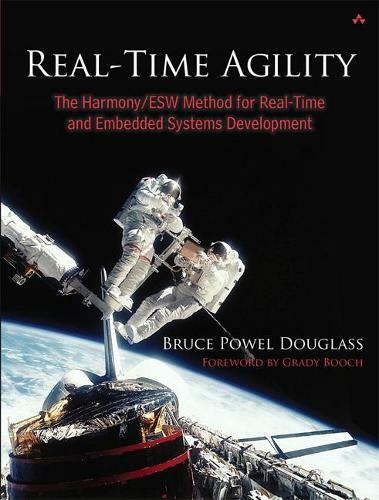 In Real-Time Agility, leading embedded-systems consultant Bruce Powel Douglass reveals how to leverage the best practices of agile development to address all these challenges. Bruce introduces the Harmony/ESW process: a proven, start-to-finish approach to software development that can reduce costs, save time, and eliminate potential defects. Replete with examples, this book provides an ideal tutorial in agile methods for real-time and embedded-systems developers. It also serves as an invaluable "in the heat of battle" reference guide for developers working to advance projects, both large and small. "Regardless of your perceptions of Agile, this is a must read! Douglass's book is a powerful and practical guide to a well-defined process that will enable engineers to confidently navigate the complexity, risk, and variability of real-time and embedded systems-including CMMI compliance. From requirements specification to product delivery, whatever your modeling and development environment, this is the instruction manual." "This book will provide you with the framework of agile development for real-time projects ranging from embedded systems to web-based, data collection applications. I wish I had this book three years ago when we began a real-time, embedded drilling control system project, but all my engineers will be getting copies now that it is available. And, for my academic colleagues, this is the perfect book for graduate seminars in applied software development techniques." "We have used Dr. Douglass's books on real-time (Doing Hard Time, Real-Time UML, and Real-Time Design Patterns) for years. His books are always informative, accessible, and entertaining. Real-Time Agility continues that tradition, and I can't wait to introduce it to my colleagues." "Until now, agile software development has been mostly applied within the IT domain. This book breaks new ground by showing how to successfully traverse the perceived chasm between agility and real-time development. Although embedded systems impose challenging constraints on development teams, you can always benefit from increasing your agility."